So starts the newest book by Ellen Potter, author of SLOB (one of daughter’s all time favorite books). 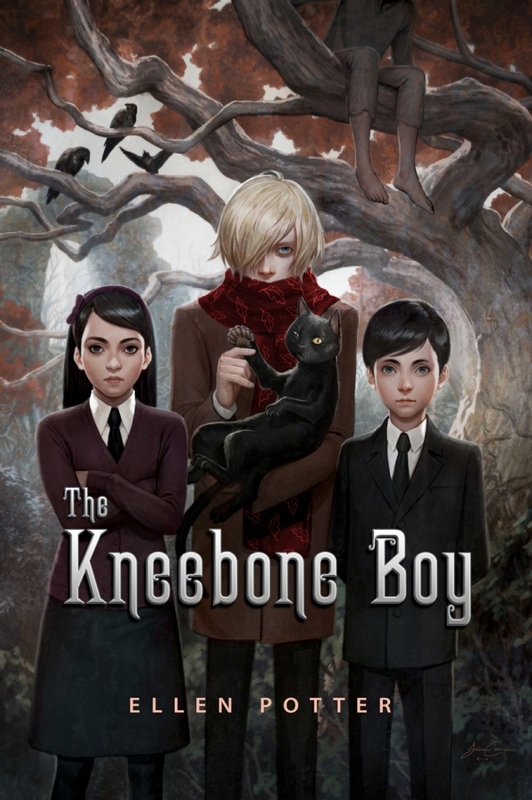 The Hardscrabble Kids, Otto, Lucia, and Max end up on an “adventure” to London when their father inadvertently sends them to stay with their aunt, who just happens to be out of town. Chapter subheadings such as this one from Chapter Two “In which Otto finds something interesting, Lucia listens to nothing at all, and more stuff happens” or “In which we finally meet The Kneebone Boy. Sort of.”move the book along nicely in a manner you can see where the author has earned her comparison to Dahl or Snicket. Originally the cover made me think the book might be about zombies, which now after listening to The Forest of Hands and Teeth, made me go back to my notes that I had made earlier this month. I think I have a serious zombie prejudice. “Almost didn’t read this book because the pale children made me think the was about zombies,” my notes revealed. Hmmm…I thought I hadn’t given zombies much thought before. It must have been back there in my subconsious somewhere. 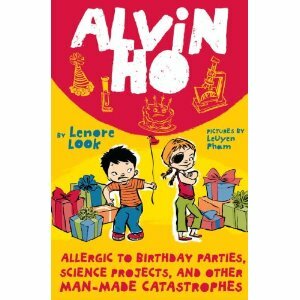 A great read, that will have kids wanting to know if the Hardscrabble children will be having more adventures. A must for school and classroom libraries. 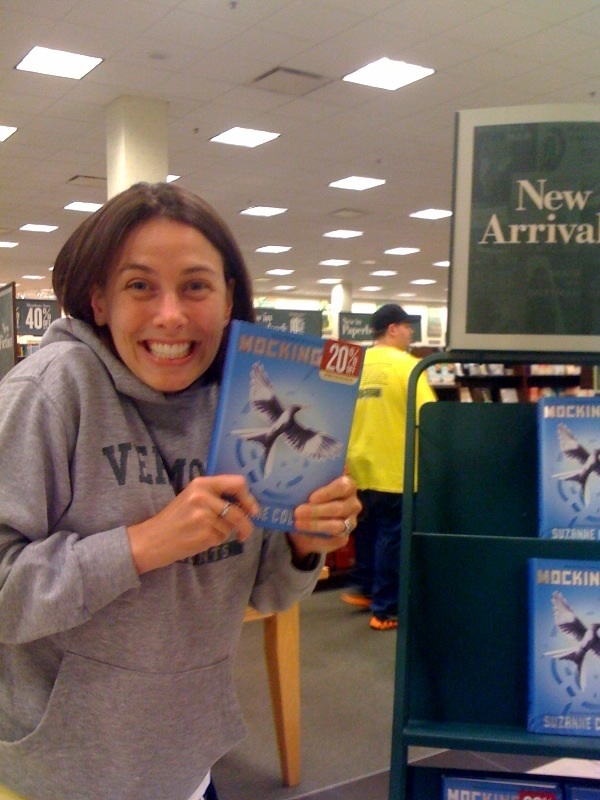 Here she is happy after we arrived at B & N! Pre-order Drama-Amazon Let Us Down! You are now connected to Kristina from Amazon.com. Me:Why hasn’t Mockingjay arrived? I pre-ordered it in April and now am told it’s not coming for 3 days! Grr Hello? Kristina:Hello my name is Kris. I would be happy to help you. Me:Hi Kris, I was expecting Mockingjay to be delivered today as this was the release day and I had pre-ordered it. Kristina:Let me take a look at it for you. Me:When I have pre-ordered in the past highly anticipated books (example-Harry Potter, it always arrived that day. Kristina:It looks like when you placed that order you selected our free super saver shipping. So it shipped out today, but it’s going to take 5-9 business days for it to actually arrive. Kristina:Just one minute while I take a look at that. Do you have the last four digits of that order? Kristina:Thank you. I’m sorry I’m not seeing that order. What’s the full order number? Kristina:I’m sorry about that. I don’t see that order here. Sometimes we are able to get the orders there in a couple of days with super saver shipping, but it can take up to 9 business days for it to get there. Me:I will be blogging my complaint later this evening. I’m a big Amazon fan and know this is not your personal fault but I am not happy Amazon should have communicated that they were going to do this pre-release differently. I would have ordered it from the bookstore that is two blocks away from me instead of pre-ordering on Amazon. A good friend of mine got a job teaching fifth grade in a nearby town. He got his job Friday. School starts Monday. I know this happens all around the country each school year, but it has me thinking. I spent the day providing an orientation for the new teacher of our districts. I had the opportunity to look over years of new teacher orientation information. I was able to talk to all the people over the summer who had a part in orientation in the past. I spent out drafts of the outline for the day. And revised. And revised, and revised. Then was able to reflect back on all the things I wish someone had told me for my first school year (a whole other post) and then tuck those tidbits in throughout the day. He spent the day procuring a job for the new school year. Where else is there a job that requires you to be able to do the same job on Day 1 of year 1 as Day 180 of year 35? Let’s say he was hired Friday to start Monday in a bank. Or in a law firm. He would go to his first meeting Monday and orientation or the training period would begin. Someone would make sure he understood the specific culture/expectations for his new workplace. Even though he would come with a wonderful background of college and advanced degree learning, each bank or law firm would have their own rules and procedures they would start teaching him during his training period. My friend, and other teachers around the country, will be assigned a mentor. An experienced teacher who will answer questions and hopefully have time to look out for him. The mentor will, of course, have their own classroom and all the full responsibilities to come with it. While most new teachers are trained in classroom management, communication, and many other important “non-academic” areas, my friend and all new teachers will need to be ready to go when the kids arrive. He will need his classroom management plan and lesson plans for the first day. The kids (and their parents) don’t want to know that he spent all weekend trying to get ready. It’s expected. Doesn’t sound too bad, right? Another layer-it’s not as easy as just deciding for himself what he will expect within his own classroom walls. He will need to make sure it complements his team members’ management plans and supports his building plan. It’s Sunday before school starts Monday. While he might be lucky and find a teacher in the building willing to take the time to explain some of those nuances, he might have to wait until Monday morning, and then try to make revisions during lunch on Monday. Of course he won’t have a computer log-on of his own yet, but he can probably use someone else’s computer. When it’s all said and done, he will do great when those kids walk in the door, and they’ll never suspect he even broke a sweat trying to get ready. After all, isn’t that what all teachers do to make sure the new school year is ready for the kids? Because of Mr. Terupt by Rob Buyea John Irving wrote the blurb-how can I resist?